The Washington C.H. Fire Department’s newest, multi-functional fire truck will be in full service this Thursday. “We will be doing training with the new truck the next couple of days so the guys know exactly how it works,” said Tom Youtz, the chief of the Washington Fire Department. This truck - a 2014 Rosenbauer - was purchased from All-American Fire Equipment, a local company. According to Scott Monroe, of All-American Fire Equipment and also a part-time firefighter, there is a compartment at the front of the truck that will house two 100-foot hydraulic reels, a rescue pump, rescue tools, and up to 150 feet of pre-connected hand-line hose. This truck carries 1,000 gallons of water and features a 1,500-gallon-a-minute pump. The truck has a better turning ratio than “141” and has a shorter wheel base. Pictured are Matt Smith, Chief Tom Youtz, and Lt. Tim Downing. The Washington C.H. Fire Department’s newest, multi-functional fire truck will be in full service this Thursday. “We will be doing training with the new truck the next couple of days so the guys know exactly how it works,” said Tom Youtz, the chief of the Washington Fire Department. This truck – a 2014 Rosenbauer – was purchased from All-American Fire Equipment, a local company. According to Scott Monroe, of All-American Fire Equipment and also a part-time firefighter, there is a compartment at the front of the truck that will house two 100-foot hydraulic reels, a rescue pump, rescue tools, and up to 150 feet of pre-connected hand-line hose. This truck carries 1,000 gallons of water and features a 1,500-gallon-a-minute pump. The truck has a better turning ratio than “141” and has a shorter wheel base. Pictured are Matt Smith, Chief Tom Youtz, and Lt. Tim Downing. 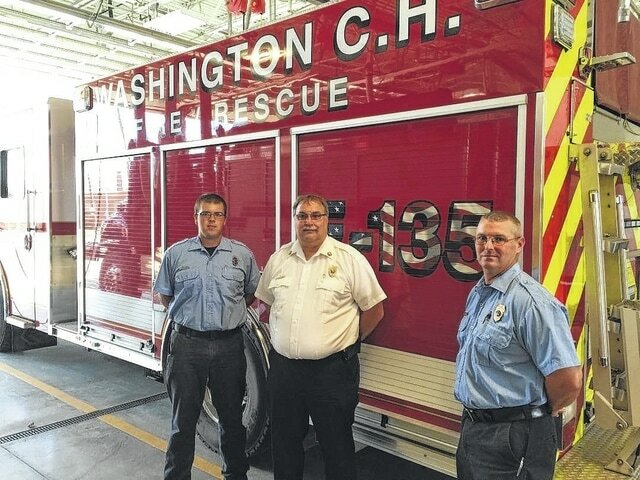 https://www.recordherald.com/wp-content/uploads/sites/27/2016/08/web1_FireTruck2016.jpgThe Washington C.H. Fire Department’s newest, multi-functional fire truck will be in full service this Thursday. “We will be doing training with the new truck the next couple of days so the guys know exactly how it works,” said Tom Youtz, the chief of the Washington Fire Department. This truck – a 2014 Rosenbauer – was purchased from All-American Fire Equipment, a local company. According to Scott Monroe, of All-American Fire Equipment and also a part-time firefighter, there is a compartment at the front of the truck that will house two 100-foot hydraulic reels, a rescue pump, rescue tools, and up to 150 feet of pre-connected hand-line hose. This truck carries 1,000 gallons of water and features a 1,500-gallon-a-minute pump. The truck has a better turning ratio than “141” and has a shorter wheel base. Pictured are Matt Smith, Chief Tom Youtz, and Lt. Tim Downing.